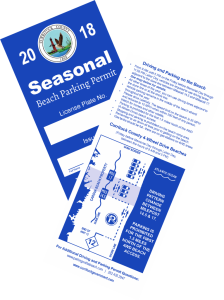 Beachgoers who wish to park on Currituck County’s four-wheel drive beach this summer will need a county-issued beach parking permit displayed on their motor vehicle. Click here for the most current beach parking permit information and a list of frequently asked questions. All county residents and property owners may receive a free beach parking permit for each vehicle they own by providing proof of ownership and current liability insurance. The permits will be issued specific to each vehicle. County residents who live north of the North Beach Access Ramp may obtain two additional permits. These permits will not be specific to a motor vehicle and may be used by guests of the resident. Owners of a property located north of the North Beach Access Ramp that is in a rental program may receive two additional permits. These are not specific to motor vehicles and may be used by renters staying at the property. All others must pay a fee for a beach parking permit. These permits will be available for purchase from the Tourism Department on a temporary or seasonal basis. Fees will be $50 for a 10-day parking pass (valid for 10 consecutive days) and $150 for a seasonal pass. 10-Day – This permit is available for purchase ($50) by individuals who want to park on the four-wheel drive beach but are not Currituck County residents or property owners and are not renting a home in the off-road (4wd) area. This would apply to day visitors or those staying anywhere other than the four-wheel drive beach. From the Friday before Memorial Day through Labor Day, between the hours of 9am and 5pm, vehicles shall be parked adjacent to the water’s edge. The driving lanes during this time frame will be along the dune line and in the middle of the beach. Please do not block the driving lanes with lawn chairs, coolers, fishing lines, or any other items that restrict public safety and emergency response vehicular movement in a north-south direction. You are more than welcome to enjoy our northern beaches via 4WD vehicle. Driving on the Corolla beach is a unique experience and requires drivers to take many safety measures. Well before approaching the beach ramp (four-wheel-drive area), stop in a legal parking area and adjust the air pressure to 15-20 psi in all four tires. This will provide more surface contact with the sand.